ShowFood Chef: Orange & Pinot Jelly; YES I CAN! I did it. I did it, again. I joined another monthly challenge. But who can blame me with this one? It's the brain child of Tigress Can Jam and every month we will be hot water canning or jamming a pre-chosen ingredient. 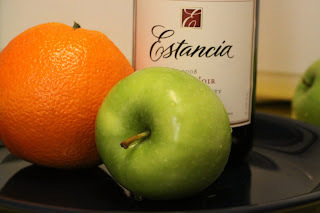 To kick off 2010, the ingredient is CITRUS. Since I've made a lot of marmalade, and because I'm possessed with wanting to push my own envelope I chose to try something new. And let's face it; wine? Even if the jelly didn't work I could have a blast drinking the leftovers! However: the jelly not only worked, it's so unusual and tummy warming without being too sweet - I've eaten it by the spoonful. I grew up watching my Grandmother can and jam, but as a kid didn't pay much attention to the how, just the rewards. The impressions that stayed are: boiling water making the windows steam over in the kitchen, jars and jars sitting on muslin (lining the table, window sills and counters), sugar bags with cups inside for easy access, lemons squeezed by her farm hands until nothing remained but dry yellow shells, the smell of hot fruit and the music of the lids as they pinged to an air-tight hug. Canning and jamming is a time honored tradition that is centuries old and yet has returned to be a truly hip and happening culinary art form. 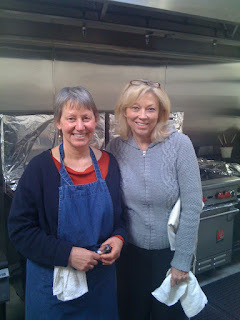 If you haven't tried making jam yet, it might be because you've fallen for the fear tactics, as the famous and talented sugar artist, June Taylor, explained in a workshop I took with her in Berkley, CA last year. As June expressed: Some where in the 1950's American home cooks were convinced (mostly by the expanding "convenience food" processing companies) that it was a waste of time for people to cook at home when they could buy it, zap it, or reheat it in a few minutes. The idea of actually PRESERVING it yourself was old fashion and could kill you if not done by a large corporation. It created a generation of folks who felt embarrassed to actually cook or preserve daily food. Thankfully, we are rediscovering how important fresh seasonal food is for our families and our communities, and how easy and modern it is to extend our seasons and talents by creating our own jars of treats and savories. 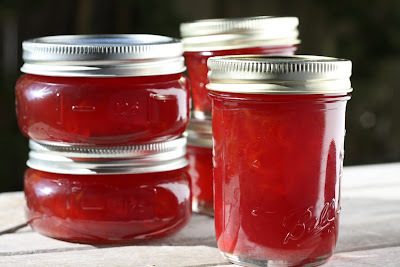 Instead of eating those tasteless dollar jars of "almost fruit" jams; Learn the easy basics, and like anything else; you CAN make your own. Cut apples into quarters, cover with water and boil for about 20-30 minutes. Pour soft apples and the juice through a cheesecloth or jam bag and press on the bag to get all the juice. Let the juice sit in the refrigerator over night so the sediment can settle. The next day, filter again through cheese cloth and save juice. Zest the Oranges and boil them in water to cover for 10 minutes, drain and save. 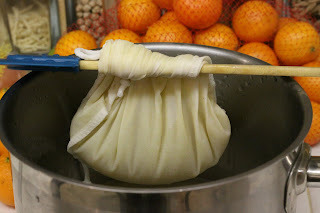 Then, squeeze juice from Oranges and filter through a cheesecloth, saving the seeds and pulp in the cheesecloth. 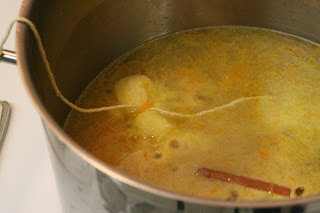 In a large pan, preferably a preserving pan, add the orange juice, the juice from one lemon, the apple juice, the zest, cinnamon stick, cardamon, cloves, sugar, and the tied-up cheese cloth full of seeds and orange pulp. Bring this to a boil, skim, and keep boiling for about 12 minutes while stirring now and then. Remove the cheese cloth and cinnamon stick. Pour in the Pinot Noir and continue boiling until the temp reaches about 220F. [Or check for your set using this method: Keep a small plate in the freezer. When checking the set, spoon a small bit onto the cold plate and if it has a "shoulder" to it (a bit of a rise), or you can drag a finger through the mixture leaving a clear path, you're good to go for a loose gell. Remove the preserving pan from the heat while you check this. 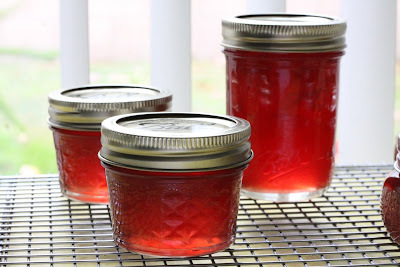 Pour your jelly into prepared jars, place them in readied water bath, boil for 10 minutes, carefully remove and wait to hear the song-of-pings when the tops close tight on your success. This jelly is amazing on toast and muffins or bread, but also adds quite a zing to cheeses and meats. Hope you'll try this; and let me know so I can admire you. 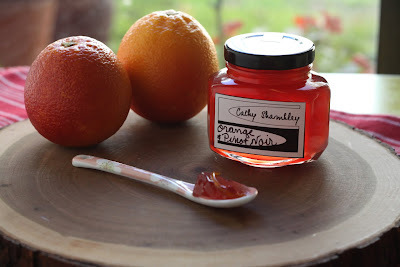 Quote from my adorable daughter: "I didn't think I'd like this, I don't like marmalade and seeing the zest made me think ewww, but it's not marmalade it's just really delicious jelly and I can taste the wine and it doesn't have that "way too sweet" thing going on. I love it! " wow--looks delicious! so glad you are able to sell your own creations! seems like a lot of red tape to do that here in texas. great post! I love that story of your childhood. So visual. Looks delicious and the color is glorious. Boots: Always appreciate yr photo comments. Big fan of your pics on flikr. I hate marmelade and I LOVED this concoction. Your stories are so vivid. Makes me feel like I had a little mini-vacation in the middle of typing on my computer. Keep'em coming! Mmmm LOVE the color of your jelly!